Posted in 52 Ancestors Challenge on June 19, 2015 by Amy Johnson Crow. First, I want to thank everyone for the good wishes sent to my mom. She’s home from the hospital and is doing well. This week’s recap is another thin one. I appreciate your understanding as my schedule has been a bit… different… than it usually is. The optional weekly themes for July will be posted next week. Keep an eye out for those! 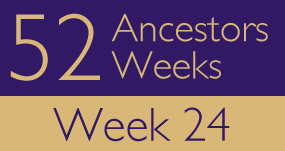 Who did you write about last week as part of the 52 Ancestors challenge? Leave a comment with a link to your post and a bit about your ancestor. While you’re here, take a look at the ones from Week 23! A fancy dress made by my maternal grandmother. It’s about money as a heirloom. Once we were rich … Or not? An anniversary gift that has been handed down. A wedding gift, a spinning wheel and a soldier’s trunk…. 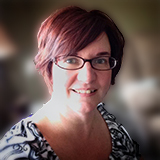 DNA led me to discover a fellow quilter amidst my ancestors. How I wish I had one of my 4X great grandmother Margaret Vought’s quilts! My great, great-grandfather was a joiner by trade, but he made art as a hobby. An odd postage stamp collection tells part of his story. For this week’s challenge of Heirloom I wrote about a rocking chair that belonged to my great-great-grandmother! My great-great-grandfather made a set of six chairs for his children. My parents have one of the chairs, and my second cousin once removed has two of them. I really enjoyed the posts I’ve read so far this week on heirlooms. I have other heirlooms which need to be catalogued and written about but the one I featured this week is full of history. So much more than I realized. I had to break my post up into two parts, first the heirloom and second the family. I have so many heirlooms that I didn’t know where to start. So I didn’t. I provided links to previous articles about some heirlooms and then told the story of a hard working farmer who was done in by a cherry tree. For good measure, my food post this week uses a family heirloom. Can anyone give me more information on this glass bowl? I’m looking forward to browsing through other people’s heirloom collections. 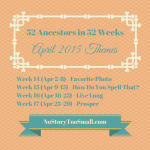 My Week 24 post: https://themixthatmakesupme.wordpress.com/2015/06/13/heirlooms-a-rose-is-a-rose-is-a-rose-52-ancestors-no-24/ . I decided memories of my terrific family were my dearest possessions — all made possible by my parents. THOMAS, Ivor John – Terry’s maternal grandfather worked for Standard Oil in Shanghai where he purchased two large embossed Chinese mirrors on wooden stands. One of them now sits proudly on our living room hearth, a treasured family heirloom. William Frederick Lane because I discovered him through heirlooms! I chose to not follow the theme this week as I have already blogged about my heirlooms. Linked below are an heirloom post and my post #24 for this year. I found this card in the box of photos that my sisters and I inherited from our parents. This is a Valentine’s card that my mother, Marguerite “Mickey” Noble Furlani, sent to my father, William Condy Furlani, for Valentine’s Day 1945. FRANCIS, George Washington and his wife Clementine received a sterling silver engraved cup for their 50th wedding anniversary in 1910. This was for Fathers Day and I thought I sent it earlier. It was week 25…..
EVERETT family heirloom is the name John. It’s crazy how many of my relatives are named John, Jack, or the Spanish version, Juan. I’ve lost count.